ZoomInfo’s Admin Portal (for admins only) allows you to control the details of your account such as adding new users, managing credit limits, resetting passwords, creating groups of users, and setting custom mapping with your integrations. The Admin Portal can be found at the bottom of the left-hand menu bar. Once you're in the portal, the upper left-hand corner will display the table of contents: Admin Dashboard, User Management, Group Management, Company Settings, and Integrations. Review each of these sections below to learn how to perform different actions across each function within the portal. The Admin Dashboard gives you a quick over of your account to understand how many seats and credits have been used compared to how many are still available as well as an overall usage report for seats currently being used. Credits Usage shows the total number of credits your organization has, how many you’ve used, and the number of credits remaining. Seats Usage shows how many ZoomInfo seats you’ve purchased, how many you’ve used, and how many are left. Each seat equals one user. The User Management page allows you to add and edit user details. Along the top of the page are quick action buttons to help you get started. Add Users: Easily add single or multiple users. To add a single user, you'll need to fill in the following information in order to send the invitation to your new user. When setting the User Credit Limit, you can choose whether this limit resets monthly or only when you manually reset the limit for the user. Note: you can change the credit limit later on, but you'll need to set an initial limit to continue with setting users up. Select add Multiple Users from the Add Users drop-down. Note: you can add up to 100 users at a time using this template. Replace the content in the .CSV template with your specific users. Once complete you can then upload the file and review the users before sending out the invitation links. 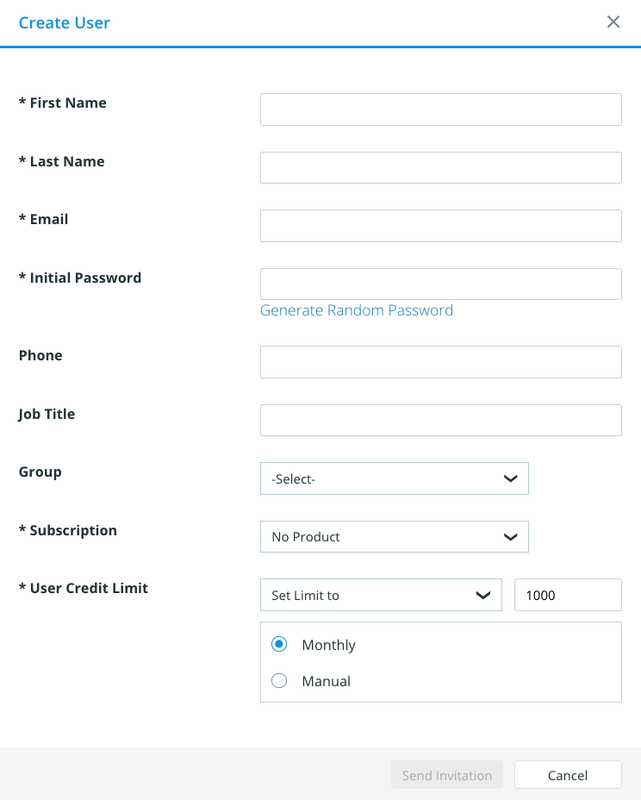 Actions: You can Reset Passwords, Manage Limits, Assign Products, Assign Groups, or Deactivate Users by selecting the user(s) from the list below and then simply selecting the option in the drop menu to apply. Resetting Passwords - To reset your user(s) password(s), you'll need to enter a new password for them. They will be able to change this once they've successfully logged in. Managing Limits - Change the credit limit for users you've already created. You can select a new limit or set no limit. If a limit is set you can choose to reset this monthly or only once manually reset. Assigning Products - Select the product from the drop down to assign to the user(s) and click 'Submit'. Assigning Groups - Assign users to a pre-defined group within the drop down or select 'Add New Group' to create a new group. Deactivating Users - Turn off user's access by deactivating them. Once deactivated, if they need to be activated again you'll need to click Add User. Resetting Usage - Reset users credit usage back to 0. 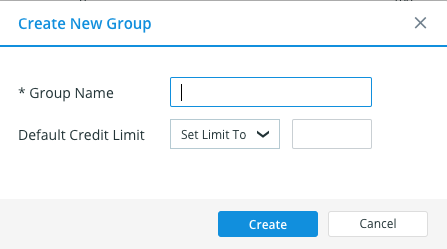 The Groups page allows you to see the groups you’ve created, the number of users in each group, the credit limit applied to the group, and the last time the group was modified. 2. Fill in the group details. Don't forget to set credit limits! 2. Change the group name or default credit limit and select Save to make these changes. 2. Click Delete Group and select OK to confirm. The Company Settings allows you to force log out for users that are inactive for a specified time. Our default is 8 hours and this can be changed to anywhere between 1-8 hours using the sliding bar. Each user can establish the connection using their external system log-in credentials within their own ZoomInfo instance, but Admins have the ability to set which integration options are available to connect to, set limitations on what can be exported with the integration, and customize what ZoomInfo data gets sent to specific fields in your connected database. 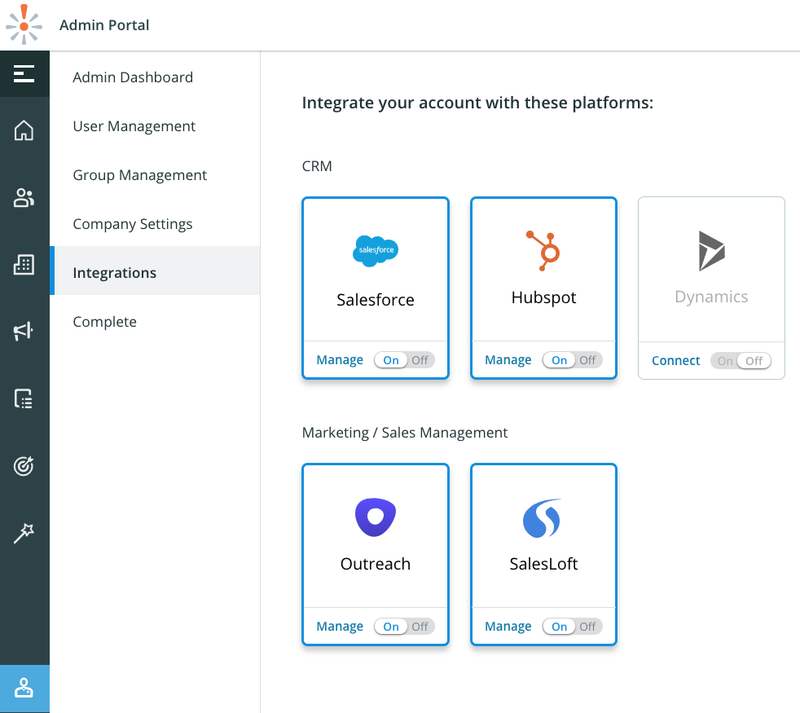 To configure which integration options your team can see and connect to, go to the Integrations tab and use the toggle under each tile. To learn how to set up the export permissions for users and custom mapping, visit our Setting up Integrations section.